Case IH’s commitment to reduced input costs has resulted in a host of prestigious AE50 awards, which recognise innovative designs in agricultural equipment. The awards hailed two products used by Australian farmers – the Steiger 485 and the ideal O-ring seal used across the Case IH range of spray bars – as important global designs, with four other global Case IH products also recognised. 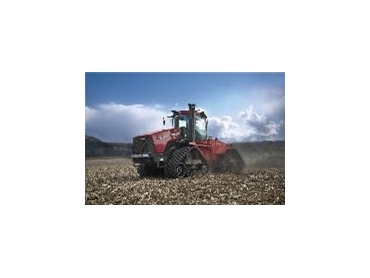 Sponsored by the American Association of Agricultural and Biological Engineers, the Steiger 485 tractor was awarded for its compound turbocharger engine technology, which results in improved fuel efficiency. “It’s the first time turbo compound technology has been used in an agricultural tractor application,” explained Case IH Marketing Manager, Stuart Brown. The technology uses a second turbocharger to convert energy otherwise wasted as exhaust to provide additional power for increased fuel efficiency. The engine also operates with reduced noise, weighs less and takes less space than the previous engine. “The use of two types of turbochargers also provides a more even response over a wide range of engine loading,” Stuart Brown added. The new O-Ring sealing system on the Case IH range of spray bars was awarded for its ability to reduce the footprint of the machine, thereby reducing fuel costs. “Traditionally, spray bars have been designed to using stainless steel pipe with pipe threads,” Stuart Brown explained. The thin-walled stainless steel tubing weighs less and allows more flow while maintaining the same tube outer diameter for spray nozzle mounting. Tubes can be made in various lengths and diameters with many combinations of outlets for any boom width. “The end result is a lighter bar, helping to reduce input costs by minimising the machine’s footprint in field,” Stuart Brown said.